Irma is gone. Put down your hammers, saws and rakes. It’s time to have some fun! Looking for a way to forget the aftermath and enjoy yourself? The artists who exhibit at the Downtown Art Gallery in Titusville invite you to join them on Friday September 22, 2017 from 6 to 9 pm as they celebrate the Gallery’s 15th Anniversary and express their appreciation of owners Heidi and Jeff Thamert. Since 2002 the Thamerts have served the North Brevard Arts Community, offering state of the art digital printing, printing reproductions of paintings and photos, from archival quality prints on paper to large canvases. They also offer artists and the public every type of framing. Both Heidi and Jeff are award winning photographers and in addition to their own work they have made room for area artists to share their space. The gallery exhibits Florida themed art in many media including paintings, watercolors, photography, metal work, digital art, sculpture, ceramics, jewelry, basketry and more. The evening will include live art demonstrations, refreshments, music by RG Evans and an opportunity to meet the artists. 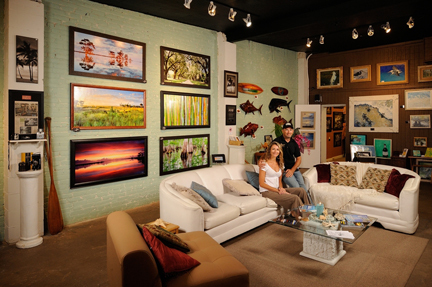 The Gallery is located at 335 S. Washington Avenue in downtown Titusville. For more information go to www.thedowntownartgallery.com or call 321-268-0122.